The annual Welfare and Safety of the Racehorse Summit continues to be a shining example of what cooperation, thorough data collection, and thoughtful analysis can accomplish in a sport as complex as Thoroughbred racing. Particularly valuable is a continuing refinement of the risk factors that lead to catastrophic breakdowns. The more the industry learns, the more the myths surrounding breakdowns are exposed, such as the notion that a “bad step” causes many breakdowns or we simply need to live with the percentage of breakdowns seen today. Fortunately, an increase in objective analysis is shedding a brighter light on the circumstances leading to breakdowns. Dr. Lisa Hanelt, an examining veterinarian at Finger Lakes Gaming & Racetrack in New York, gave an insightful presentation on her efforts during the past two years to develop a model for identifying at-risk horses. Hanelt, a self-professed lover of spreadsheets, began her risk-factor analysis of the Finger Lakes racing population by assessing how many starters in a race with a catastrophic breakdown fit one or more of nine risk factors identified in 2011 by Dr. Tim Parkin. Parkin is a veterinarian and epidemiologist from the University of Glasgow, who serves as consultant on the Equine Injury Database and performs analysis for The Jockey Club. She found that many of the nine TJC risk factors described most of the horses racing at Finger Lakes, where 98% of the horses are more than 3 years old and 77% of starts are in claiming races. Hanelt did a detailed study of 19 horses that had orthopedic-related fatalities during 2013—looking at their racing, ownership, and training histories; historical pre-race exam findings; and documenting every incident behind one being put on a vet’s list. “The Jockey Club risk factors are important, but every racetrack and every population of horses are slightly different,” she said. Her analysis showed that the fatally injured horses were not typical of the Finger Lakes population. Granted, Hanelt noted, 19 horses are a small sample, but she found several traits in common among the fatalities that allowed her to zero in on the highest risk factors at Finger Lakes. • treatment with inter-articular steroids. Hanelt then did risk factor scores using her new list. In the results of three races she showed at the summit, the horses that broke down fit into five of her five highest-risk categories. She found several horses that scored four out of five. One of the horses that scored a '4' belonged to a trainer, who ended up retiring the horse because he had recognized that continuing to race her became unacceptably high-risk. Regular communication between the examining vets and the trainers goes a long way toward making the best decisions for the horses. Hanelt said examining veterinarians may not know as much about a horse's health history as a trainer or private vet, but will share information discovered during a morning exam or pass along a post-race observation. This is important information-sharing that could help avoid catastrophe later. Hanelt concluded her presentation discussing the value of checklists, citing the best-selling book The Checklist Manifesto by surgeon Atul Gawande. The author argues that despite the tremendous knowledge we have, avoidable failures still plague us in health care, government, law, the financial industry—everywhere. Gawande’s book focuses on making better decisions in complex and emotional situations by using a simple checklist. 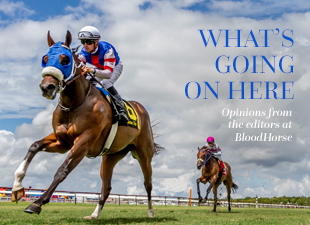 Having a standard checklist to monitor the health of a racehorse regularly and determine whether it should be entered in a race, or even should still be running, would benefit everyone, according to Hanelt. The same knowledge can help owners, too, assess whether their horses are being managed properly. We have the tools, and the information is getting better all the time. Now we just need to use them. Editor's Note: A previous version of this column stated the risk analysis scores had been shared with trainers. These scores had not been shared.